With a foundation built on class-above luxury, unrivaled performance and an athletic character, the Mazda3 is a hallmark of the compact car segment and a fan favorite at Earnhardt Mazda Las Vegas. The debut of the next-generation 2019 Mazda3 builds on that foundation and many car shoppers want to know – what are the differences? Find out with this 2019 Mazda3 vs 2018 Mazda3 comparison. All-new 2019 Mazda3 entries are available in four trim level packages – Base, Select, Preferred and Premium – that will be available in sedan and hatchback variations. Current 2018 Mazda3 models are available in three trim levels – Sport, Touring and Grand Touring – that can be tailored to fit your lifestyle with capable sedan and sporty hatchback versions. Next-generation 2019 Mazda3 Hatchback editions will be available later in the model year. What Are the Differences Between the 2019 Mazda3 and 2018 Mazda3? Price is a key element in any car-buying decision and may factor into yours when you explore this 2019 Mazda3 vs 2018 Mazda3 comparison. With a price tag that starts at $21,000, the 2019 Mazda3 Sedan has a higher price tag, but comes complete with a more powerful engine, a new and improved MAZDA CONNECT™ touchscreen infotainment system and a wealth of interior and exterior updates. Drivers who have their heart set on the 2018 Mazda3 will enjoy an impressive list of amenities, a fuel-efficient SKYACTIV®-G four-cylinder engine and a more affordable price tag that starts at $18,095. Drivers who choose the 2019 Mazda3 will enjoy a standard 8.8-inch MAZDA CONNECT™ touchscreen infotainment system that provides access to Apple CarPlay, Android Auto and Bluetooth capabilities. Highlights of the 2019 Mazda3 design include 16-inch alloy wheels, a signature Mazda triangular grille, LED headlights, LED taillights, an eight-speaker sound system, push-button start, remote keyless entry, a rearview camera and Dynamic Stability Control with a Traction Control System. Upgrades to the 2019 Mazda3 spec sheet include a 12-speaker Bose® sound system, i-ACTIVSENSE® safety systems, heated front seats, Greige and Red leather interior packages, a power moonroof and more. 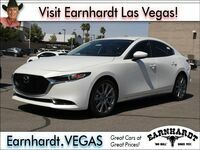 An athletic drive is a hallmark of the Mazda3 nameplate that gets an upgrade when you opt for the 2019 Mazda3 at Earnhardt Mazda Las Vegas. All 2019 Mazda3 entries come standard with a 186-horsepower 2.5-liter SKYACTIV®-G four-cylinder engine that can be paired with a six-speed SKYACTIV®-Drive automatic transmission or a six-speed SKYACTIV®-MT manual transmission that is specific to the Mazda3 Premium Hatchback. Equipped with the automatic transmission, the 2019 Mazda3 will earn 26 mpg in the city and 35 mpg on the highway. The 2018 Mazda3 employs a 155-horsepower 2.0-liter SKYACTIV®-G four-cylinder engine that can be paired with a six-speed SKYACTIV®-Drive automatic or a six-speed SKYACTIV®-MT manual transmission that will translate to 27 mpg in the city and 36 mpg on the highway with the automatic. To upgrade performance, the 2019 Mazda3 will be available with the innovative Mazda i-ACTIV AWD® system that pairs with G-Vectoring Control Plus to take driving thrills to the next level. Later in the model cycle, the 2019 Mazda3 is expected to add a 1.5-liter SKYACTIV®-G four-cylinder, a 2.0-liter SKYACTIV®-G four-cylinder, a 1.8-liter SKYACTIV®-D diesel engine and the all-new SKYACTIV®-X engine platform that will feature the Mazda M Hybrid system.